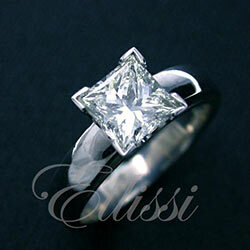 Princess cut diamonds are most commonly square. The sides are usually the same length as each other (at least to the eye), if not in actual exact measurements. It is also possible for them to have a more rectangular shape. However, this is much less common and seldom seen in the engagement ring market, where the Radiant cut diamond is generally used for a longer, rectangular look. The fact that a princess cut has sharp corners gives rise to some limitations in the engagement ring design. This is because the corners require a degree of protection to prevent damage to the diamond or the wearer of the ring. Princess cut diamonds are set in three main ways: claw set, bezel set or a “corner cap” setting. In a claw setting, there are generally four claws, but these can be double or even triple claws. With a bezel setting, it can be either a partial setting or the full rim around the diamond. Corner cap setting is a claw like setting but with the two sides of the corner being protected in a kind of “L” or “V” shape. The princess diamond cut design is referred to as a “Square Modified Brilliant” by the GIA on its grading report. It is not the case that the diamond itself has been modified in some way before being set into the engagement ring, it is just that the term “princess cut” is trademarked, so cannot be used by the GIA. Many examples of princess cut ring designs are displayed on the Ellissi site, including simple solitaires, halo clusters and three stone rings. Princess cut diamonds can be used as shoulder diamonds that are set into the band of a ring. However, they are not as versatile in this area as the round brilliant cut, basically because you cannot curve them around as you can with diamonds that do not have flat edges and corners. Usually if used as a complimentary diamond, smaller size diamonds are channel set into the shoulder. The princess cut diamond usually has around 66 facets. However, this number can differ in some variations of the cut. A well cut princess cut diamond of 1.00 ct weight will have a diameter between 5.4 – 5.5 mm and a table (main top facet) that is approximately 72 %, of the total diameter of the diamond edge to edge. There are many examples of poorly cut diamonds that have a much smaller diameter, as they are quite lumpy, and a lot of their weight is found at the back of the diamond, making them look significantly smaller than better cut examples of the same weight. “Zeta” Princess Cut diamond solitaire. “Hanna” Princess cut diamond solitaire. “Lucy” Princess cut diamond halo cluster ring. “Ariadne” princess cut diamond solitaire. “Isolda” Princess cut diamond in a square halo ring. “Mirabella” Princess cut diamond solitaire. “Megan” Princess and Baguette cut trilogy ring. “Charlotte” Princess cut diamond solitaire. “Pure” elegant Princess cut diamond solitaire.